I have consolidated my various websites nurtured over the years since posting three pages of hyperlinked text together in 1997, which constituted my cricket club's very own website - WECC (West End Cricket Club) - which amounted to "hello world", "who we are" and the mighty "fixture list", all lovingly crafted using Netscape Composer. Since then I've planted more into their own little corner plots including Johnny Kidd & The Pirates - simply because no-one else had done it! I also had the pleasure of looking after The Pirates (Johnny Spence, Mick Green and Frank Farley) for a while, for their then manager Bernard Futter. Once Ray "Big Bloke" Gomm took the reigns, he completely expanded it, including Johnny Spense's dalliances with "Doctor's Orders". Many thanks for all his hard work, which I am proud to host here. I somehow found the time to add Shane Fenton and the Fentones - one of those forgotten bands who pre-dated the British Beat Boom, paving the way for the tide of bands that covered the country in the m id 1960''s. My goodness - that venerable "Home on the Web" hosting service goes back a long, long way in terms of Web history, before Yahoo was big enough to take it over. When I started out they offered free website space totalling a grand 2Mb filespace - Wow! There were times when I got dangerously close to filling it too, only 1mb short. Crikey. Sometimes I nearly had enough time to browse through it all before the tiddly copper cable fell over, first at 33kbs, later 56kbs. We'd never had it so good. That the WWW was growing co-coincided with cheaper storage and servers, so when the website allowance magnified over time to 25Mb, I was so grateful to Yahoo! I saturated the West End Cricket Club site with more pages, photos and even a few small videos of the fun we had. A couple of seasons later I was gasping for more. So what's next? I might add some of my boring photo collection, or add other ideas rambling through my disorganised brain (ooh Matron, it hurts) as a bit of fun, experimentation, or purely for the hell of it. It's my plot and if you don't like it I'll take the ball home with me. Anyway, in the meantime, click on one of the links to view one of the copious sites I rescued from oblivion which current versions now reside here. Drop me a line if you're really that bored, that is...! Remember "Shakin' All Over"? This original Brit Rocker did a hell of a lot more than just that classic number one; his soulful voice was ahead of its time, wrote his own songs when unfashionable to do so, helped crystallise the "Power Trio" format, influenced the Who among many other groups with his powerful line-ups of backing combo the Pirates. Add to all that Mick Green's style influencing a generation with his economical but powerful guitar playing. Sadly, Kidd never really capitalised from it all but is now recognised as a great in Rock. And there's more where that came from! Or how to make village cricket quite interesting with laughs along the way! This site stagnated after the club drifted apart, however all that was ever uploaded remains and has been subject to slight re-jigging here and there. Read about the origins of Shane Fenton. Of course you know him - this was the original stage name for the star we currently know as Alvin Stardust! 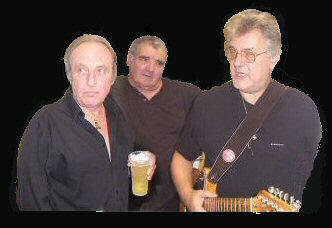 He and his group the Fentones produced a series of minor classics of early 1960's Brit-Pop.